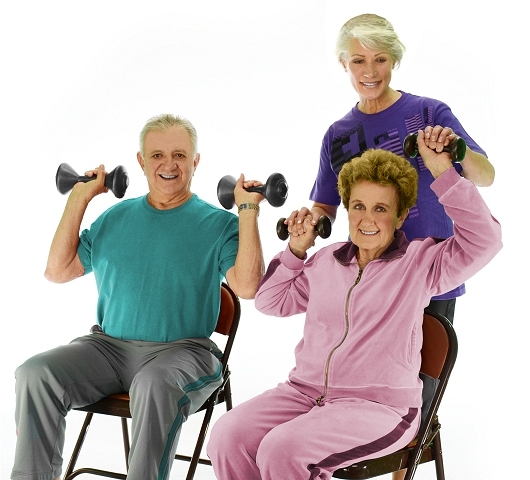 Lower body strength improves balance, reduces falls and allows for greater mobility as humans age. If you’re having difficulty walking or maintaining your balance, it’s important to work on your strength and balance. The National Institutes of Health recommends seniors work on their balance – even when balance isn’t a concern – to age without losing mobility. Side leg raises help build the hip muscles which are a major proponent of balance. These exercises can be modified with a table, chair or a walking aid. If you have balance issues, ensure that you hold onto a surface or bar that is snug and won’t fall over. You never want to fall and risk potential injury when performing balance exercises. Do several sets of 8 – 15 repetitions. If the exercise is too easy, add ankle weights as necessary to further build muscle. You’ll want to stand near a chair or table with your feet slightly apart. Stand a foot to a foot-and-a-half away from the chair. Repeat the exercise on the opposing leg for 8 – 15 repetitions for each leg. If you can’t perform this exercise while standing, you can switch to a floor version, which may be safer depending on your mobility level. YouTube has a great video on proper form and execution of a glute kickback, which is similar. Proper hip flexion allows the foot to leave the floor and go up a step, for example. These small muscles are often overlooked in the gym, and they can be performed sitting or standing. We’ll discuss how to perform hip flexion exercises while standing. You’ll use the same table or chair for added balance as discussed earlier. Again, you can add ankle weights if needed. You can do this exercise seated, too. Keep the back against a chair while performing this version of the exercise. Perform 10 – 15 repetitions on each leg for 3 or 4 sets for best results.